For ages 7 to 14 yrs old. 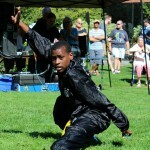 Youth and junior students will learn kung fu as described in the Traditional Kung Fu Program. Since young people are still developing physically, mentally, and emotionally, kung fu training for them will also gear towards their personal growth. Some students may even be challenged more in different ways to motivate and aspire them to their natural talents and abilities. All students will develop at their individual pace and are expected to learn respect, patience and control, teamwork, self-discipline, and hard work. The program will help young people gain self-confidence and esteem and develop healthily through meaningful and fun kung fu training. Voted Best Martial Arts School in Malden for 10 consecutive years!